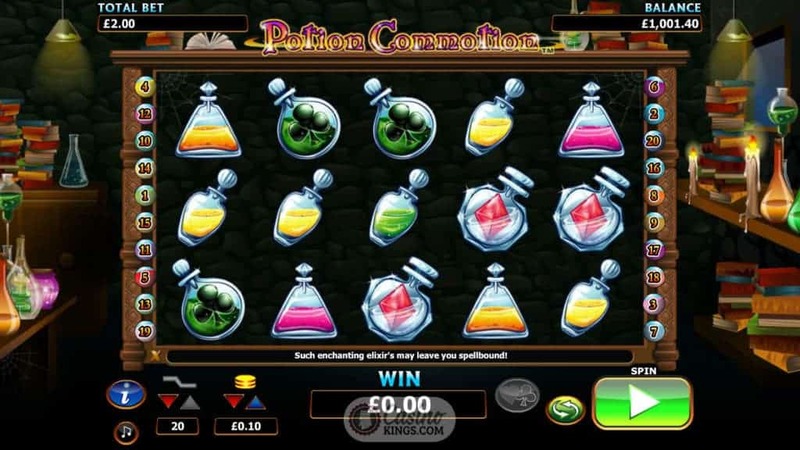 Who hasn’t dreamt of creating a magic potion that will conjure up a hatful of cash at a moment’s fancy? In fact, why not have a magic potion for everything? Throwing a dinner party? Magic Potion! Making a move on a would -be lover? Magic Potion! One step at a time. 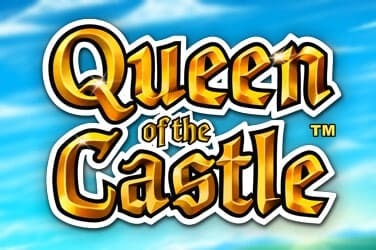 First, we can enjoy the magic potion that NextGen Gaming are serving up in this entertaining and spellbinding online slot. 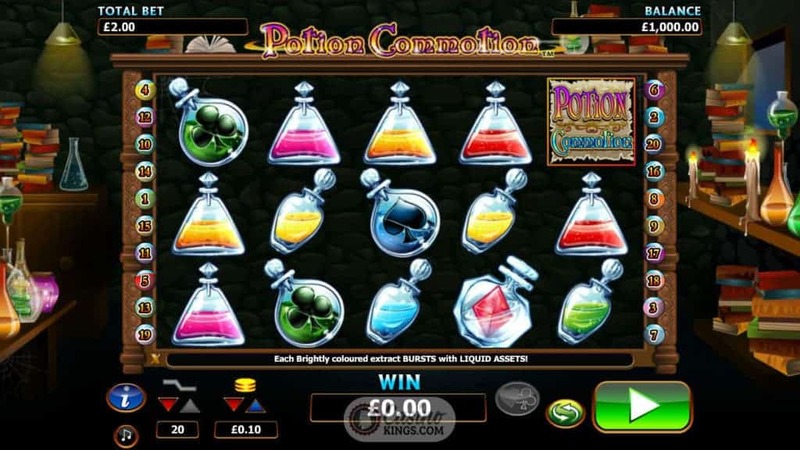 What would you imagine the symbols to be in an online slot entitled Potion Commotion? Potions? Spot on, Mickey! Lots of potions of all colours and varieties. But how to distinguish from one potion to the next? That’s where we come in, as we spin these five reels in search of the potion that will bring us riches beyond our wildest dreams. But hang on…are we supposed to drink these potions? Some of them have suits in. Not fizzy laces or jelly strawberries but Hearts, Diamonds, Clubs and Spades. It better be a very tasty broth to help those down the gullet. 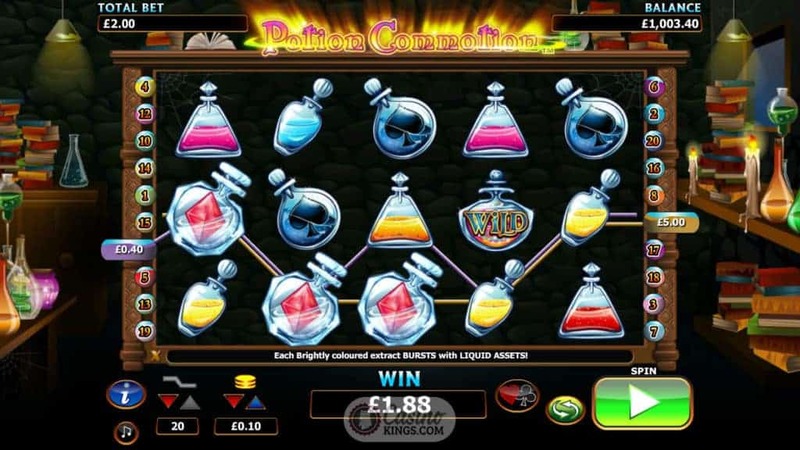 A playful ditty sounds as we spin the reels to help the medicine go down, and the Wild Potion speaks for itself, substituting for all other potions to make the right mix for a winning line or two out of the game’s possible 20. And all taking place in the comfort of what looks to be an alchemist’s closet. Cosy. 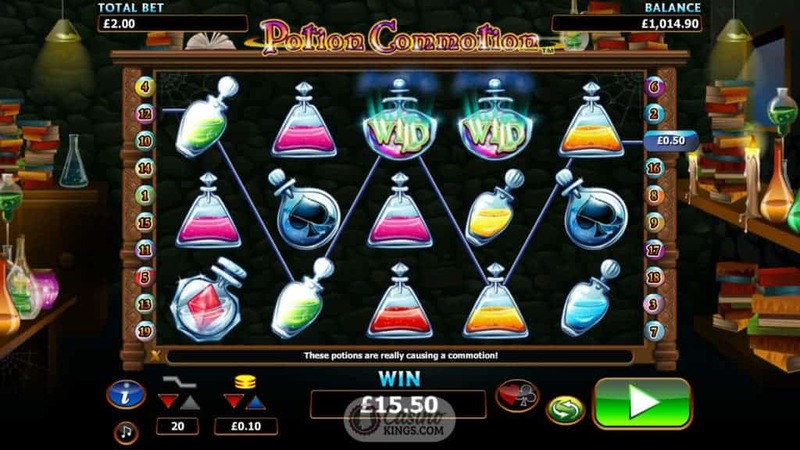 Three or more Scattered Potion Commotion Game Logos launches the game’s bonus feature, a Free Games outing that can see us land 10, 15 or 20 Free Spins when landing three, four or five Game Logo Scatters. Not that scattering magic potions usually sounds like a good idea. That’s the type of thing that would see your broomsticks start dancing around. 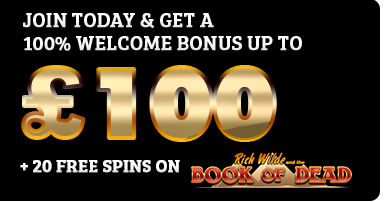 However, it’s worth the risk here as all our wins in the bonus game are tripled to the magical rule of three. 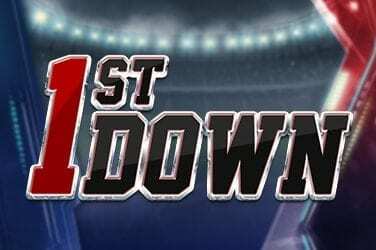 And just as sorcerers and alchemists gamble with their safety and ours, in keeping with this theme we have the option to Gamble any of our wins on the flip of a card. Choosing the correct colour will double our win, while matching the correct suit will quadruple it. The suits from the Gamble Feature match the suits in the base game potions nicely, tying up all our loose ends in this adventurous tale. 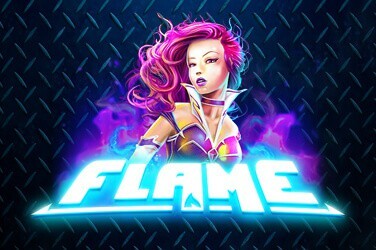 With a sorcerer’s hatful of coins on the line in this twinkling online slot from NextGen, it takes adventurous online slots players to go for it. Are we sorcerers’ apprentices or fools on a magical and elusive quest? 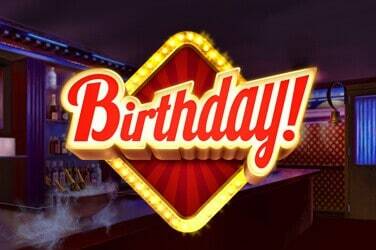 Only our winnings tally will tell.